The one wall in the living room has become my "gallery wall." 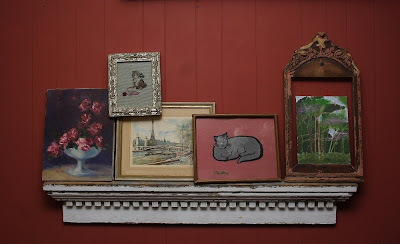 I bought the old mantel shelf from an antique store before the days of ebay. The rose painting I was so excited to get at a live auction, I was expecting it to go high, as it was in the hey-day of shabby chic madness on ebay...the auctioneers went through everything in the house and finally said, 'well, that's all, folks," and I said, what about that painting?? A lot of people had left, or were already standing in line to cash out...so a painting I'd expected to pay $50 for, I got for $7! I was so excited! I bought the framed watercolor of Paris and the Eiffel Tower on ebay - I'm addicted to all things Eifell Tower! I bought the cute kitten-and-ball-of-yarn needlepoint (could it BE any cuter??) in the ornate gilt frame at an estate sale. The needlework cat has green sequin eyes and is signed by the artist, Mildred. The cat's name is Mildred. And the forest acrylic painting was done by my daughter, and is set inside a chippy frame that used to hold a mirror that broke.